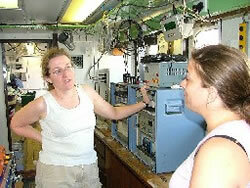 It is now the last week of the cruise and all acquisition and analysis systems continue to run well. CTD station 122 has just been completed. The good weather to which we had become accustomed broke at the beginning of the week. The wind rose and the swell grew. The increased sea state slowed our progress between stations but did not affect our capacity to complete those stations. The weather is better now, the sea is very calm and the sun is even trying to break through the clouds. Everyone is gearing up for the final push as we head towards the closely spaced stations on the continental shelf and on towards Lisbon and home. Since leaving the western boundary we have had a run of good weather which has meant that sampling has run closer to that planned. So far the weather has been calm enough to reach the bottom on the deep stations. I am planning to do my full depth He_Tr station tomorrow after the SAPS which should be in water of about 5000m. We are approaching our 56th Station. When we arrive, SAPs (stand alone pumping systems) will be deployed at 50m, 100m, and 150m where they will pump water through filters for two hours. The filter papers are stored for analysis of pigments and nitrogen 15 isotopes. Following the SAPs the CTD will be deployed. The sun is shining and the sea is calm. The good conditions are helping us to easily execute stations in over 5000m of water without resorting to a more heavy-duty cable. Long may it continue...Elaine McDonagh. Weather is still mixed but at least it hasn't interrupted any more days of sampling. 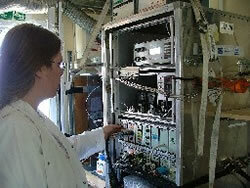 The more recent He-Tr stations have gone more smoothly now we have had more practice at taking the samples. It looks from the ADCP plots that we managed to put a He_Tr staion in the Western Boundary Current and we definitely managed to get a station in the Gulf Stream on our second crossing of the boundary current. Susan. Things are better on the ship now. The weather has definitely improved, but a bit choppy again today. Hope everything is well back on lovely land. Please say hi to everyone from me. Rhiannon. 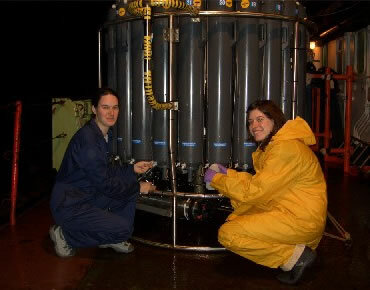 Susan Leadbetter (left) and Rhiannon Mather (right) taking samples of water on the RRS Darwin. The sampling of the first crossing of the Gulf Stream has been completed, but for the last 36 hours no sampling has been done due to bad weather.